Despite the excitement surrounding the arrival of GM’s Volt in 2010, the electric car is nothing new. In the early 20th century, there were several companies manufacturing electrics, including Detroit Electric, Anthony Electric, Rauch & Lang, and Baker Motor Vehicle Co. 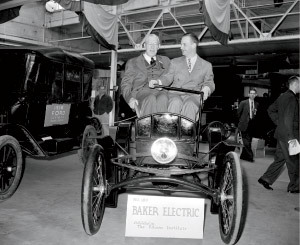 Here, Charles Brady King (left), who designed and drove the first car to take to the streets of Detroit in 1896 (three months before Henry Ford), is perched next to Benson Ford Sr. in a circa-1903 Cleveland-made Baker. 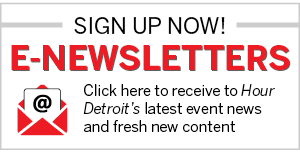 The occasion was likely part of the Golden Automotive Jubilee, marking the 50th anniversary of the automobile in Detroit, which included a splashy parade and other events. Electrics were preferable to gasoline-powered autos for several reasons. There was no need for a crank, they were quiet, and they emitted no fumes. There was one downside, though: Electrics were more expensive. Fans of electric cars included Thomas Edison (naturally) and Henry Ford’s wife, Clara, who tooled around in a 1914 Detroit Electric Brougham until the 1930s. Comedian Jay Leno, a fervent car buff, owns a renovated 1909 Baker Electric Coupe. When the electric starter was introduced in 1912, obviating the need for a hand crank, cars that ran on gasoline became far more attractive. That invention, together with Henry Ford’s affordable Model T (about half the price of an electric auto), pulled the plug on the electric car. But a surge of renewed interest amid the petroleum crisis and zero-emission mandates could well mean that a car long thought of as quaint is ready to ride high again.